New Delhi: Anupam Poddar, undoubtedly one of India’s most important contemporary art collectors, hardly needs an introduction. Poddar has been acknowledged worldwide as a premier patron in the ArtReview Power 100 list and on CBS News’s and Apollo Magazine’s lists of the top 20 most influential collectors today, alongside François Pinault, Viktor Pinchuk, Eli Broad and Sheikh Saud Al Thani, the cousin of the Emir of Qatar. 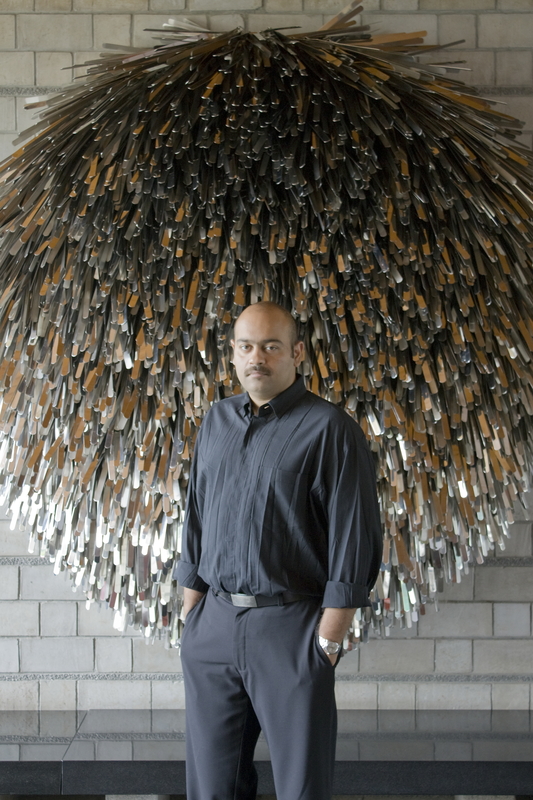 Based in New Delhi, Poddar along with his mother, Lekha, set up the Devi Art Foundation in 2008 to house their collection of more than 7,000 contemporary, modern and tribal artworks from across the Subcontinent. India’s first non-profit art center, it was set up to encourage the viewership of the most cutting edge and experimental work from the region. Poddar’s collecting interests have transcended Indian art to encompass Central Asian art including art from Uzbekistan, Oman and Pakistan. He and his mother travel to these countries in search of the best art and talent. The exhibitions at the Foundation are curated out of their collection. In 2010, the Foundation organized Resemble Reassemble, a cross-section of contemporary Pakistani art featuring the works of 45 artists who are part of Poddar’s collection, including Farida Batool, Imran Qureshi, Ayaz Jokhio, and others. Ahead of our inaugural Pakistani Art Auction, Anupam shared his insights about art from Pakistan in this tete-a-tete with Yamini Telkar of Saffronart. View the slideshow below for Poddar’s favorite works from the auction. Q. What got you interested in art from Pakistan? I find contemporary art from Pakistan, honest, fresh at the same time experimental and challenging. It is amazing to see the quality of work produced by young students. During one of Rashid Rana’s visits to India, I happened to see images of some works that I found extremely exciting. Soon after, my mother and I made a trip to Pakistan to meet the artists. Q. Having collected both contemporary Indian and Pakistani art, what according to you are some of the similarities and divergences between the two? Despite having a shared history, I feel contemporary Pakistani art is more experimental in nature than Indian art. The artists follow their individual pursuits with convictions that are not driven by the market forces or contemporary trends; their personal expressions are highly skillful and insightful. Q. There is a trend among the ‘culturalti’ to engage in India-Pakistan dialogues. Do you think this has any bearing on artists and the art world? Would you as a collector/institution be interested in such projects? I don’t think so. They are very few artists who engage with the politics between the countries as their subject matter.To stay away from this, the curatorial strategy of ‘Resemble Reassemble’ was to create a playful visual narrative and not a national survey show. As a collector/institution we wanted the exhibition to challenge the preconceived notions many viewers have and at the same time set up a platform for Indian artists to interact with works and artists from the other side of the border. Q. Based on your interactions with contemporary artists from Pakistan, what are some of their main concerns? One of their concerns which I find very exciting is to preserve the miniature tradition. At universities, it is re visualized and presented in a way that it challenges its own boundaries and often tends to surprise the viewer with the outcome. Otherwise, works revolve around their local realities or regional issues. Due to political and financial constraints, many Pakistani artists do not get an opportunity to travel which makes their work more rooted in local realities which are far closer to them than that of an unseen world. Q. What trends do you see marking the development and collection of Pakistani art in the near future? What is your opinion of an auction dedicated to Pakistani Art? Compared to the past, there is a lot more interest in contemporary art in Pakistan. We see many galleries opening up in different parts of the world, dealing solely in Pakistani art. There was a presence at Documenta this year, many art fairs and international auctions. An auction dedicated to Pakistani art is a great idea. It makes it much easier for people to buy art from the region, by bypassing bank transfers/shipping/customs – which are an absolute nightmare! I think the visual art as contrasting to its cousin the written art is handicapped in that it cannot be as motile. Paintings, installations, architecture cannot be wisked away through magic lamps to Aladin’s wishful cross-border audiences even with the wands of redtapes unravelling to better barters. The only answer to this then would be to do it the other way round: Art pilgrimages to those seeking art’s jannat. Mannats fulfilled thru flights, buses, trains. Open borders, let imagination flow through.